Dr.Anuradha Raja is a leading practitioner, practices at Trichy in Tamil Nadu. She has wide clinical experience in treating Clinical illness. She received her basic Medical studies from Government Homoeopathy Medical College, Tirumangalam and has 14 years experience in the field. Here she presents a case of Osteomyelitis. A female aged 38 years working as an accountant in sub-treasury came to my clinic. She had head injury one year back. Now she was diagnosed to be having osteomyelitic changes (Plate - I) at the site of past head injury and she was advised to under go another operation. · She had head ache, lt forehead severe pain especially at the site of injury almost throughout the night. She met with a road accident one year back and got injured over head especially on left frontal region then became unconscious. She was admitted in Meenakshi mission hospital, got operated for Haematoma. Sensitive person, very active, talkative with high confidence about herself. 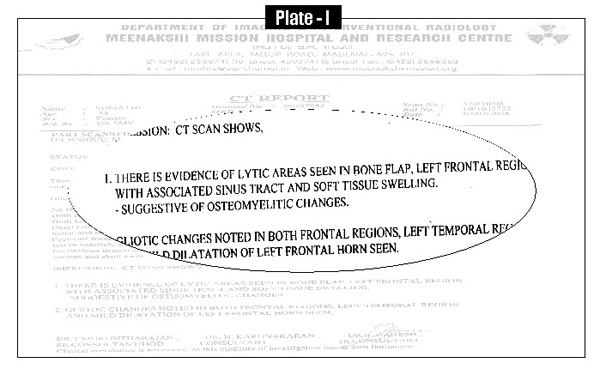 O/E: there was a pit on the suture line in lateral forehead. When I slightly pressed pus came out. Followed by SL for 7 days. Patient came with a smiling face, pain and pus discharge persist. But she told that she gained confidence and felt better. Pus discharge persist.Sometimes a bit of hard substance, came along with pas. Followed by SL for next one week. No head ache but had pain while cleaning the wound. Along with SL for 15 days. O/E: The pit in the suture line disappeared, wound healed completely. 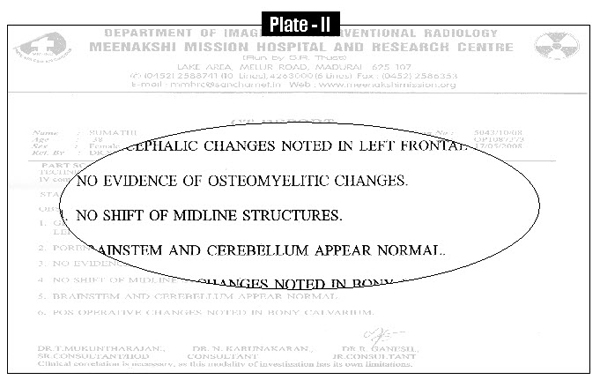 I advised her to undergo CT Scan-again – which revealed that there were no osteo myelitic changes. (Plate - II) .